CLICK ON THE PLAY BUTTON ABOVE TO SEE A PREVIEW OF THE VIDEO. YOUR PURCHASED COPY OF THE VIDEO – JUST $3.90 – WILL BE FREE OF ADS AND CAN BE PLAYED OFFLINE! YOU CAN ALSO SEE THE VIDEO BY CLICKING ON THE CENTRE OF THE IMAGE BELOW…. Fantastic children’s interactive song to encourage singing and participation. Each letter in the alphabet dance has an action to go with it, and the children characters face the kids and show them how it’s done! Great song for learning the alphabet, for co-ordination, imagination, language, cognition, sensory stimulation, and lots more.Our familiar character friends also appear – our cow, monkey, duck, the sheep, dog and giraffe. The alphabet letters also have a life of their own – do watch what they get up to!And a little heads up….. there’s a funny ending to say the alphabet. See if you can do it too! There are many more videos and songs on our website too – check out the menus VIDEOS and SONGS. And under BOOKS AND TOYS you can see our signature products which are complete matching sets for the ultimate engaging experience for children. 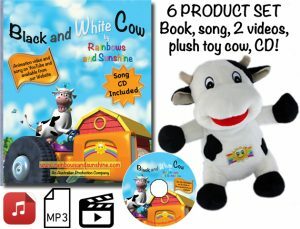 Black and White Cow has a book, song CD, mp3 download, 2 videos, and a 21cm plush toy cow – all to match. 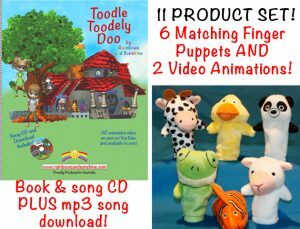 And similarly for Toodle Toodely Doo, there’s a book, song CD, mp3, 2 videos and 6 cute finger puppets which represent each of the animal characters appearing in the book and videos. Every product is available individually so you can choose your own, and the matching sets are fabulous gifts for little ones as they provide a complete sensory experience – designed for participation, fun and learning through simultaneous engagement at every level – auditory, visual, tactile, learning, and active involvement.